When you hear the word “photosynthesis,” a big, green leafy plant probably comes to mind. Plants use photosynthesis to turn light energy (usually from the sun) into energy they use to survive. There are some plants, like maize and sugarcane, that have evolved to use an advanced form of photosynthesis making them more than 50 percent more efficient than your average plant. This advanced photosynthesis has remained a mystery – up until now, that is. 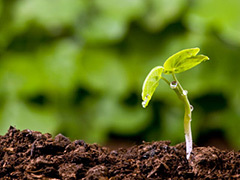 A group of mathematicians has identified the evolutionary changes that make up the physiology of the more efficient plants, according to an article published on ScienceDaily. This advanced photosynthesis allows the plants to use less than a third of the water, grow quicker and capture 13 times more atmospheric carbon dioxide than plants using regular photosynthesis. Well, imagine the benefits of applying these evolutionary advancements to our crops. A new breed of super-crops could be a big game changer. These crops would use less water resources, be available sooner to those in need, not to mention decreasing levels of carbon dioxide in our atmosphere. "Encouragingly for the efforts to design super-efficient crops, we found that several different pathways lead to the more efficient photosynthesis -- so there are plenty of different recipes biologists could follow to develop to achieve this,” said Dr. Iain Johnston of Imperial College London, the study’s lead mathematician. What’s next? Biologists will need use this recipe to test on plants and, eventually, on rice. To learn more, check out the study, Phenotypic landscape inference reveals multiple evolutionary paths to C4 photosynthesis, published in eLife. Posted on October 22nd under Global Ecology.